Don’t let the light rain fool you. As showers are tapering off Wednesday, a larger band of rain is headed down the state toward San Diego. It's the second of three storms expected to arrive in San Diego this week. 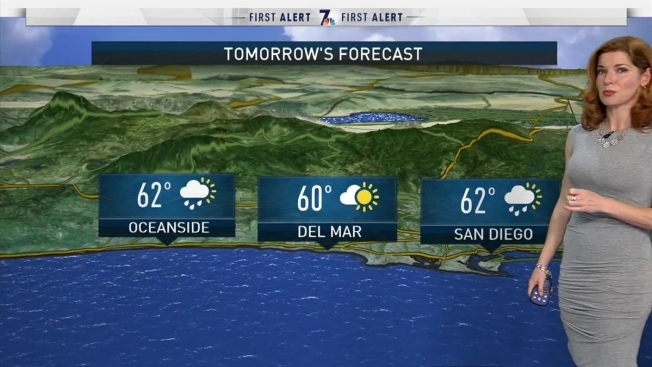 “We will have a little clearing this afternoon, but more widespread, moderate rain will move into our county, late tonight,” said NBC 7 Meteorologist Jodi Kodesh. Mid-level clouds hung over San Diego mountain ranges Wednesday evening, but precipitation wasn't expected to start up again until the overnight hours. “Most of us will be sleeping, around 11 p.m., but scattered showers will stick around through the Thursday morning commute,” Kodesh said. The series of weather disturbances are accompanied by gusty winds in the mountains and deserts. The National Weather Service has issued a wind advisory for San Diego County mountains and deserts through 11 p.m. Winds from the west will reach 20 to 30 mph with gusts up to 50 mph. The strongest winds will be in the afternoon and evening. Snow levels will gradually lower to 6,500 feet Wednesday then to 5,500 feet Thursday and possibly as low as 4,500 feet late Friday into Saturday. While this will not be a major snow event for San Diego County, resorts up north (Big Bear, etc.) should do well. Kodesh says that showers should exit the region by Sunday. More rain is in the forecast during the middle of next week.